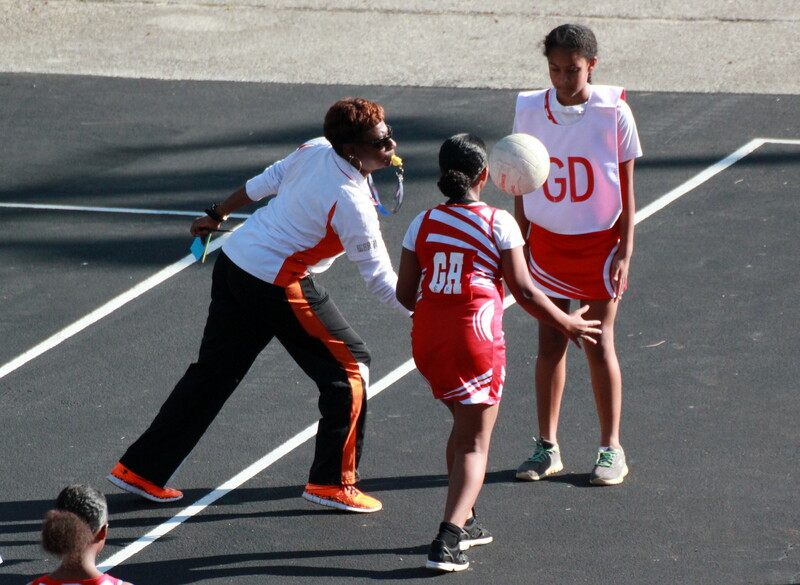 Despite the Bernard’s Park Netball Courts (The Home of the Bermuda Netball Association), been hit with continuous acts of vandalism over the past two years play continued with Digicel Youth Leagues and the Senior league matches played. In the opener the Phoenix Sparks defeated the Storm 10 – 5, Sydney Santos would lead the Phoenix Sparks with 5 goals, while MVP Khylie Smith added 3 goals and Sanaa Grant scored twice, the Storm would get two goals from Eliyah Seon and Nevaeh Barclay, with MVP Sherne McQueen adding the other. In the other match the North Village Lady Rams Reds defeated the North Village Lady Rams Whites 15 – 13. The North Village Lady Rams Reds were led to victory by Jazya Brimmer-Peets who scored 6 goals, while Xaana Green scored 5 time, with Sioma Rudo added 3 goals. Carleigh Rodney and Aniyah Minors scored 4 goals each, while JahShay Trott added 3 goals and Kari Virgil scored twice for the North Village Lady Rams Whites. Jayla Peets-Butterfield was named the North Village Lady Rams Reds MVP, while the North Village Lady Rams Whites MVP was Neveah Swan. The Warriors would go down 37 – 3 to the North Village Lady Rams Reds. The North Village Lady Rams Reds got 29 goals from MVP Rhiannon Higgins, while Coriah Simmons added 7 goals and Rae'chelle Webster scored once, while the Warriors got 2 goals from Kammie Mills and Arianna Sabir added the other goal, while Alaiah Cooper Trott was named the teams MVP. The Storm Lightning defeated the Storm Thunder 37 – 7. The Storm Lightning would get 23 goals from Amaiah Butterfield, Elishe Smith scored 9 goals and Asrael Basden scored 5 goals, with Jade Johnston named the team’s MVP, while the Storm Thunder would get 3 goals from Amaya Burt and Makaylie Smith, while Jaelyn Rewan scored once, Jamir Hatherley was named the team’s MVP. The Phoenix Fire defeated the North Village Lady Rams White 25 – 12, the Phoenix Fire got 20 goals from Nisiah Berkeley, while K'xiyae Gibbons added 5 goals, Kacey McGowan was named the team’s MVP. The North Village Lady Rams White would get 7 goals from Sanaa Berkeley and 5 goals from MVP Gabrielle Romaine. The Storm Thunder defeated Robin Hood 44 – 13, with Nabiilah Nasir leading the way with 31 goals, Kaamilah Nasir added 8 goals and MVP Selah Tuzo scored 5 times, while Robin Hood got 8 goals from Charlie Bridgman, with Kessiah Jackson adding 5 goals and Naomi Taylor was named the teams MVP. The Lindo’s Tigers defeated the Storm Lightning 33 – 14, the league leaders Lindo’s Tigers got 14 goals from MVP Demiqua Daniels, while Charlene Gomez added 13 goals, Allison Outerbridge and Apryl Jackson both added 3 goals each. The Storm Lightning got 8 goals from Jaylyn Hines, with Sonja Townsend adding 6 goals and Quaejah Cox was named the MVP. The Danielle Raynor one woman show continued as she scored 78 goals to lead the Pheonix Heat to a 89 – 26 win over the North Village Lady Rams. Raynor was named the team’s MVP, while Arkeita Smith added 11 goals, the North Village Lady Rams got 9 goals from Jahturre Trott and Darrika Simons, while Nikita Trott added 8 goals and Mali Smith was named the team’s MVP.